Channeling Sly Stone and Prince while looking straight into all the possibilities of the future, Boom Shadow is a summer sureshot from Bay Area resident Nino Moschella. In a unique mix of dirty soul and gritty funk his songs are more personal than ever, his production definitely has more boom, and those homemade beats are now backed with fuller and more dynamic arrangements. What is Boomshadow? The made-up word is a fictional character Nino Moschella and some friends concocted nearly a decade ago. "He was a super hero. It was kind of ridiculous. He didn't really have a specific power, he would just come onto the scene and save everybody," he explains. Boomshadow came back to Moschella, with a different meaning, as an idea for the title of his sophomore album for Ubiquity. It is a warm cloak of sound emanating from your stereo. It envelopes and protects all who listen. It feels good to be in the warm pulse of the Boomshadow. Moschella likens it to listening from inside the womb. The feeling of being safe and being able to trust was key to the development of this album. With the practice and feedback from an extensive set of gigs under his belt, a new live band to back him, and a close-knit crew of collaborators to work with, Moschella has a deepened trust in his own musical ability. 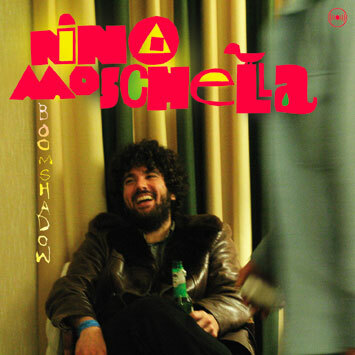 As a result Boomshadow reflects the continued refinement of Nino Moschella's sound. His songs are more personal, and his production definitely has more boom. The album launches with a frenetic flying kick to the eardrums, on an intro that reflects Moschellas' East Bay funk-inflicted home-base. It doesn't let off the gas with the raw angular funk rock of "Sleep." Fans of The Fix, his first album with Ubiquity, will recognize the progression from tracks like "Are You For Real" to the new, even more soulful sounds of "We Fight" (featuring Fanny Franklin), and on the disjointed head bumping "Around the World" and "Stella," the tribute to his daughter. On the stripped down "What U Do 2 Me" he sings a twisted anti-ballad over horns and acoustic guitar, while the music on "Time of Day" and "I Love Myself" moves with a cosmic bounce that nods to all the funk elders and ancestors. Moschella's unique homemade beats and unexpected embellishments are now backed with a fuller orchestration, and his arrangements are more dynamic. "The identity of this album was clear early on and the songs came more easily. It was less about sculpting something and more about trusting that the process would lead me in the right direction," says Moschella. "I've become more comfortable with who I am as a person in this world and naturally that informs the music," he adds. Moschella began three tracks at the Roundhouse in rural O'Neals, California (near Yosemite), where The Fix was recorded. A family-move back to the Bay Area meant Moschella had to studio-hop from an Oakland sublet, to a temporary set-up in Richmond, before finally settling in at a home studio in West Oakland. The nomadic nature of the recordings provided its own set of fruits and challenges. Rural O'Neals allowed for middle-of-the-night, as-loud-as-you-like sessions, while the more urban setting of Oakland meant that recording had to be planned around the schedule of downstairs neighbors and his daughter's naptime. Moschella had begun to find O'Neills too isolated and the draw of a more intense social and music scene in Oakland more inspiring. It was this drawn-out moving process that allowed for Moschella to play a massive amount of live shows between recording sessions, and to forge the new musical friendships that ultimately helped shape Boomshadow. While Moschella and his family moved back to Oakland, Derek Taylor, drummer for the Bay Area band The Park, contacted Nino on MySpace, as a fan. The Park had a weekly residency at the Royale in North Beach, San Francisco, and also performed regularly across the Street at Mojitos. Interested in seeing them live, Moschella turned up to one of their gigs (August 7th, 2007, the night when Barry Bonds hit his record setting 756th homerun, the place was on-fire), and when the band jumped into a Moschella instrumental he joined them on stage. The Park - which also includes Ben Schwier on keys and Josh Lippi on bass - quickly became his backing band and they discovered they shared similar musical inspirations and geographical backgrounds. "Recording has always been a very private experience for me, and it's testament to how much I trust, respect, and feel comfortable around them to have this level of collaboration," says Moschella. "Playing live with them opened me to the idea of working together in the studio." Ben and Josh co-wrote a couple of songs. The Park, plus conga player Michael Aguilar, all play on the record. Moschella and band also forged a new friendship with label mate Darondo. Together they played at the Bumbershoot festival, were picked by NPR as one of three acts to see at SXSW in 2008, and opened for Morris Day and The Time in San Francisco. Since the release of The Fix, Moschella has appeared on records by Galactic, Peder, DJ Greyboy, and Keeley & Zaire. He also co-wrote and sings on "Kiss the Sky," a collaboration with Shawn Lee which has appeared in the FX show Damages, and will be in the new Muhammad Ali documentary, Facing Ali. Moschella was selected as a guest at the 2008 Red Bull Music Academy in Barcelona and has opened for James Brown and played several festivals including the Toronto Harbourfront Festival, the San Francisco Funk Festival, and Bonnaroo.